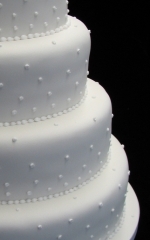 White or ivory fondant covered tiers with carefully piped royal icing dots gives a great starting point for either a beautifully simple wedding cake, or a delicately detailed canvas for us to add figures, ribbons or flowers, using inspiration from other designs on this page. Your imagination is the only limit to your wedding cake. Using sugar paste, marzipan and a range of artist’s materials. 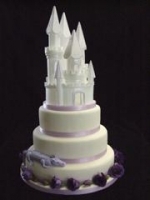 This design was for a fantasy themed wedding with a purple dragon coiled around the base tier, fresh purple flowers, and a removable fantasy castle on top. An unusual and striking design in black and white, the delicate handmade and hand-painted sugar butterflies can be made in any colour combination and gives a completely different very subtle effect in paler colours. Fresh flowers can be added, or simply scatter the cake table with rose petals. A stunning cake. 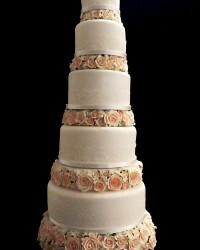 5 tiers, each double depth, with a thick layer of sugar roses between each tier. 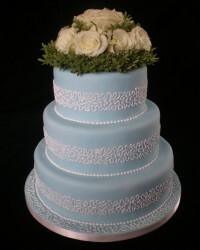 Each tier has a band of lace around exactly matching the icing colour, so adding intricate detail when viewed close-up. This is truly a once in a lifetime cake taking many days to create. Any combination of flavours can be used. 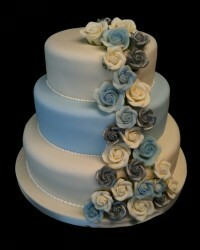 This is a stunning wedding cake and is perfect for the more grand country house / stately home wedding venues. Four intricately designed fondant iced tiers. The design can incorporate whatever you choose; hearts, flowers, your initials or perhaps even icing paw prints from your dog or cat. Each tier can have a different cake flavour and can each be decorated with a different theme. It is topped with china or glass figures – great to keep as an heirloom after the wedding. China figures price depending on design. A delicate and unusual piped filigree design around classic Wedgewood blue tiers. 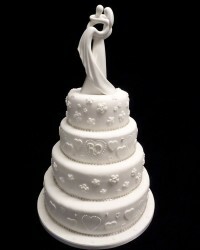 Any design in piped royal icing can be used, perhaps to complement the bridal gown. This simple wedding cake was topped with a white rose and rosemary posy. 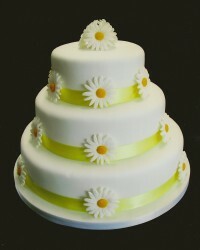 All of my cakes can be made in any colour – I simply colour the icing to match your colour swatch. 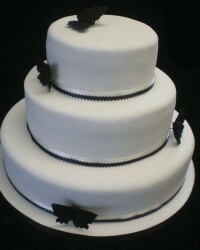 ~£650 for 3 tiers including bespoke piped design. ~£30 for fresh roses and rosemary posy for the top tier.